An inside look at the billion-dollar enterprise reveals how the Internet icon grew from a concept to a social phenomenon with a bold mission: to organize all of the world's information and make it easily accessible to people in more than one hundred languages. 75,000 first printing. Start reading The Google Story on your Kindle in under a minute. David A. Vise is a Pulitzer Prize-winning reporter for the Washington Post and the author of three books, including the New York Times bestseller The Bureau and the Mole. Mark Malseed, who has contributed to the Washington Post and the Boston Herald, has won high praise for his research efforts on Bob Woodwards recent books, Plan of Attack and Bush at War. This is not the kind of book which will describe how their technology works in detail. Anyone who expects to read about it on the book, certainly will be disappointed, although a brief explanation is given. This is good material for those to are willing to understand what was the idea behind Google, their founders background and how the company came to be what it is these days. It is interesting to see how a simple concept became one of the most admired Internet companies ever. Google, in the very beginning, was not intended to be a money maker, but just an engine which intended to help people find what they were looking for over the Internet. The book approaches the coming of corporate interest, the placement of the Google Ad-Sense concept (ads which are paid by click and not by print) and the other products that came later. In brief: this is a biography which is directed to people who admire the search engine they often use and want to know more about its story. Obviously this book does not cover the entire story of Google in depth, but it does provide a look into the company from the time the founders were students in graduate school until the time when the book was published. Covered are such material as how the company got it's financing, how the founders insisted in staying true to their dream, how the company operates and how it is challenging the big M for dominance in the world of technology companies. I completely enjoyed the book. It contained enough information to make the read interesting while keeping the technical jargon and in depth computer material to the minimum necessary for the story. This would be a good book for a high school or college library and makes an interesting study of how a company can be different and still very successful. Interesting story. Book was in great condition. 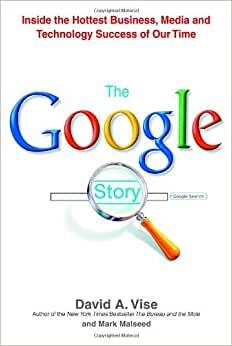 A fascinating read of the first 10 years of Google. The book introduces you to all the famous faces of Google. The only down side of this book is not introducing some of the other major faces of Google. Can be a little to praise worthy of Google at times.